"Hard as Glass" long term protection with exceptional resistance to UV light and chemicals, but also to aggressive environmental influences such as road salt, tar, and street and industrial pollution. 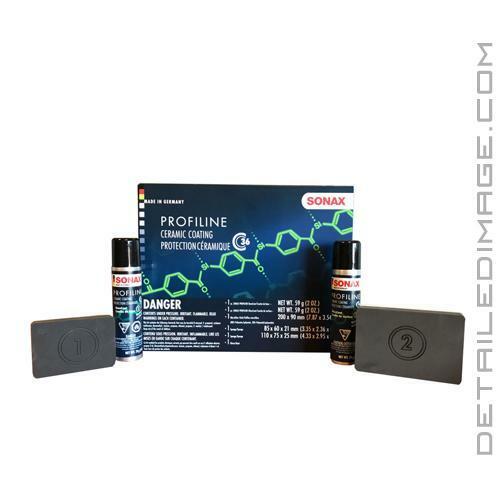 Thoroughly clean the paint and polish it with a machine to a high-gloss finish without any holograms. The surface should be absolutely clean before sealing. Then, thinly apply the BaseCoat (1) using the enclosed Application Sponge (white side). For sensitive paint surfaces, also use the enclosed Microfiber Cloth, by wrapping it around the sponge (make sure there are no wrinkles). Always treat small partial surfaces in crisscross sequence. After a short drying time (30 seconds to 1 minute at most), wipe the treated surfaces to be sealed in the same process. Afterwards, allow product to cure for at least 1 hour; make sure the surfaces are not touched and do not get wet during this time. After the prescribed curing time, apply the GlossCoat (2) to achieve a superior smoothness and deep shine. For this, spray the product onto the enclosed Application Sponge 2 (white side) and spread over all surfaces. Here, you can treat areas of a half bonnet in size, which then need to be wiped over with a Microfiber Cloth Ultrafine to remove excess product (drying is not necessary). A great ceramic coating that is easy to apply with a quick cure time! I'm extremely satisfied with how this product protects! Easy application, and extremely quick cure time. It makes the vehicle shine like crazy. When wiping off the base coat, the microfiber towels I use will sometimes grip the coating hard and rip out of my hand. Not a huge deal but thought I would mention it.